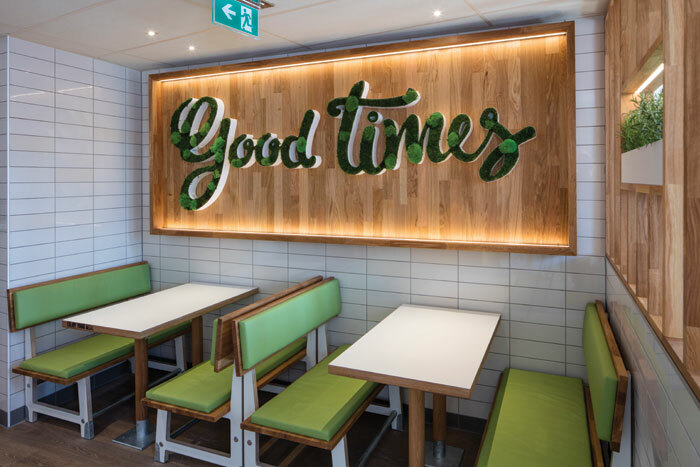 McDonald’s and KFC are picking up cues from street food stalls and pop-up restaurants, as well as the more Heath Robinson-style co-working spaces. Both have introduced new formats that lean towards the virtually ubiquitous groovy DYI- style aesthetic. For KFC, design consultancy I-AM has brought in large-format plywood wall panels with embedded graphic motifs. The consultancy art-directed the illustrations and photography using fresh herbs and handcrafted typefaces made from flour. The new messaging has been offset against panels of raw concrete, and ceramic and timber effects elsewhere. Meanwhile counter fronts have tongue-and-groove panelling in a variety of light and dark-wood tones. This new format first appeared this summer in Newcastle, and will be rolled out. 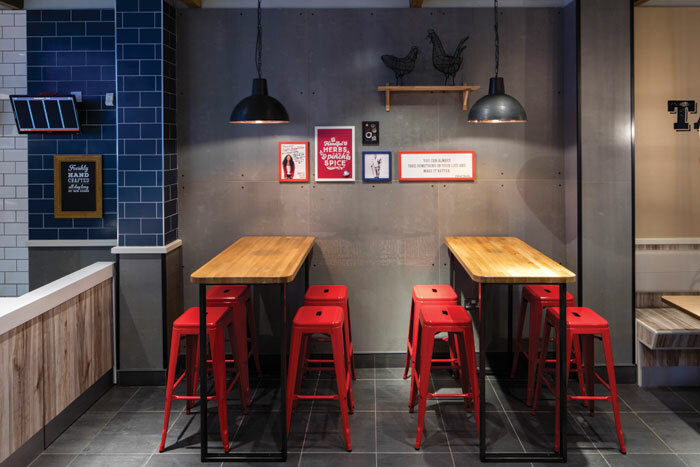 The idea was to ‘move KFC from an old-style, sanitised, fast-food feel from a few years ago, to a warmer, textural and fast-casual impression, with more variation in materiality – metal combined with timber and leather – and colour’, says Pete Champion, director of 3D at I-AM. 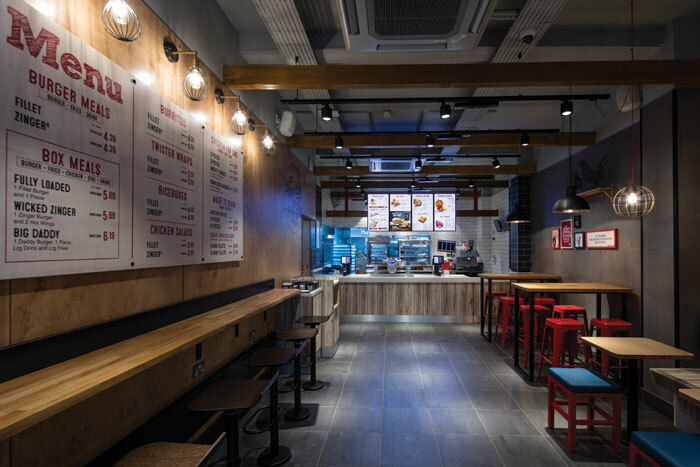 Meanwhile, McDonald’s architecture firm of record, UXUS, is rolling out a new format to existing sites, including Eastgates in Leicester and London’s Oxford Street, which opened in June. The aim here was to up the chain’s sense of hospitality and convenience. 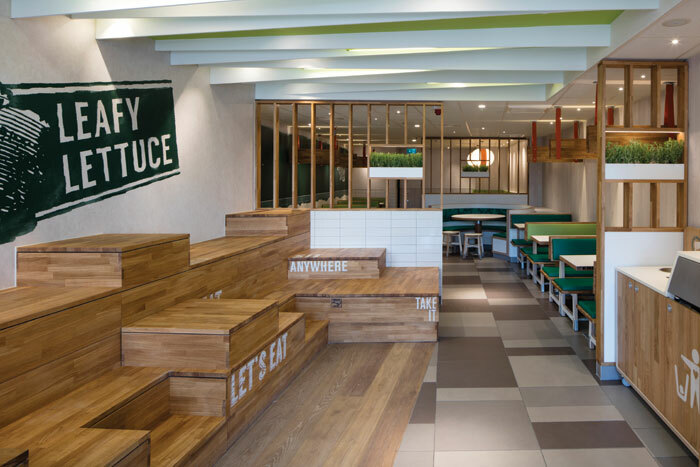 It too takes a handcrafted approach, using what McDonald’s calls authentic and upcycled materials, playful graphics and wall art. Gottl believes that bleacher seating will become more and more commonplace as the millennial generation begins to become the leading voice in the marketplace. ‘It’s a new way of thinking about how people gather and use places, that stems from a natural behaviour. It’s not a trend, but only a reflection of the lifestyle, attitude and habits of the new consumer.’ Given that at home people of all ages increasingly eat meals on their laps in front of a screen, the stepped surfaces of bleacher seating seem to make sense. What’s more, it’s quicker and easier to clean than conventional table tops. In these redesigns, both brands have distanced themselves from their fast-food routes and are attempting to move towards ‘fast casual’ dining, the category dominated by offers such as Chilango.